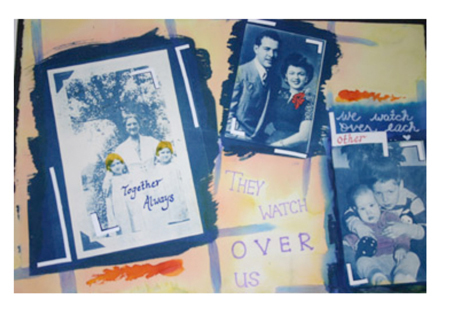 Assignment: Make a composition of a group of photographs and documents from your family history. Begin by collecting them, and then scan and make contact negatives of each to desired sizes for your collage. You may work with positive or negative images for your collage. Lay out a rough composition by marking placement of your images on the paper before printing. Then sensitize the paper with cyan chemcial individually for each image, and print in UV light using the cyanotype photo process. Develop each image and all to dry before printing again. After printing all images, use color to connect images and enhance your composition. You may use pastels, colored pencils or ink.